More and more Americans are waking up to what a bunch of lying, manipulative Decepticons their president and his cronies are. They don’t care about Americans. They only care about power over Americans. The Obama administration has used the Justice Department to punish, the IRS to silence and censor, the NSA to spy and monitor and now it is shown that they will use the intelligence community to protect their electoral behinds and lie to the people about terrorist attacks that kill Americans. K. T. McFarland explains why the truth about the Benghazi terrorist attack and the murder of four Americans. Did Obama’s Muslim Favoring Foreign Policy Cause Benghazi? 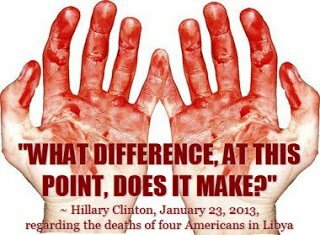 “What difference does it make?” – That Obama & Hillary Lied, Americans Died?